Urban Archeologist: Ad Quiz #13 Whatsamatta? Cat got your Breath? Thanks to programs like Photoshop, print and electronic ads are more fun these days. How else could you show the Amish - some oddly gigantic, some small - hard at work, shoulder to shoulder - some working on large mantles, some working on small mantles (right next to each other!) - without it? 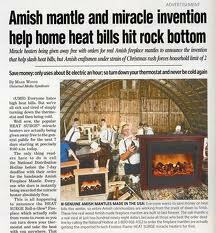 The Amish Mantle attached to a "miracle" heater is just one of the many article-like advertisements that have been around for eons, and I mean eons. Wow! 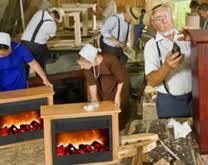 all those heaters running while they polish those mantles. That must be some kind of Amish sweatshop! Of course the "articles" are required to include the word "advertisement" above in order to separate the chaff from the husk, but the eyes are more immediately drawn to the banner text and most people start reading. Buyer beware! Thanks for guessing! Solution will be coming soon! The "article" covers the controversial and often embarrassing mental disease that creates an impulse in children to lick their cats clean at bedtime. Hair balls often then form in the throat and slowly suffocate the child in their sleep. Compounding the problem, wearing a tightly-tied hair bow to bed stunts the blood supply to the part of the brain that triggers the cough reflex, thus suppressing a life-saving response. This very thing happened to my great aunt's best friend's sister-in-law's niece. Btw, where do the amish plug in those miracle space heaters, wait, thats the miracle, tbey run in amish barns that have no electricity...its a miracle! Oh and a guess I know the product, cat breath mints, called "Ack-toids"